As the author of RideMax for Disneyland, I sometimes have friends ask if I have any “tips” for visiting Disneyland. Sometimes these friends are using RideMax to plan their visit, and sometimes not. Let’s elaborate on these in more detail. When visiting Disney’s theme parks during crowded seasons of the year especially, it’s important to be at the front gates well before the park opens for the day. Arriving early gives you access to the shorter lines right after the park opens, as you can imagine. But another huge advantage of arriving early is that it helps you get the most out of the FastPass-Plus (FP+) system at Walt Disney World, and the FastPass (FP) system at Disneyland. At Walt Disney World’s theme parks, where the FP+ system is now in full use (with no paper FPs in use at all anymore), arriving early allows you to use your FP+ reservations earlier in the day, opening up the possibility of obtaining more FP+ slots once you’ve used your first three. At Disneyland, arriving early is even more critical for efficient FastPass (FP) use. For those who aren’t aware, after you obtain your first FP ticket, you can’t obtain another one until either two hours have elapsed, or until the “ride window” for that first FP ticket has arrived, whichever comes first. Early in the day, those FP windows can be as close as 40 minutes away from the time at which you obtained the FP ticket, allowing you to get your next FP ticket 40 minutes after the first. Contrast this with later in the day, when the return windows for some of the more popular attractions can stretch out to several hours away instead, forcing you to wait the full two hours before you can get your next FP ticket. The other significant thing to note about the Disneyland FP tickets is that they can “sell out” by midday for some rides (depending on crowd levels), so arriving early helps you to not get “locked out” entirely from getting FPs for certain attractions. If you’re visiting Walt Disney World especially, it’s critical that you buy your tickets well in advance of your trip. Disney allows you to make your FP+ reservations 60 days in advance if you’re staying onsite in a Disney hotel, and 30 days in advance if you’re staying offsite. And FP+ reservations for popular attractions and time slots can sell out very early, so it’s important to secure those FP+ reservations as far in advance of your trip as you can. The catch here is that you have to have your actual tickets in hand before you can make those FP+ reservations. Once you have your ticket numbers, you can create an account on Walt Disney World’s My Disney Experience website and “link” these tickets to your account. Once that’s done, you can make your actual FP+ reservations. Note that if you’re using RideMax to create and optimize your itineraries, the RideMax plan will tell you when it thinks it’s best to actually use those FP+ tickets. So the idea is that once you have your RideMax plans created, you then go into My Disney Experience and adjust your FP+ reservations to match the times shown on your RideMax plans. The point is that the earlier you make your FP+ reservations, the more likely it is that you can get the time slots you want (or which your RideMax plan specifies). So buying your tickets in advance is critical. For Disneyland visitors, the same “buy tickets early” advice applies, but it’s not nearly as important as it is for WDW guests. If you buy your Disneyland tickets in advance, it can save you some hassle the first morning of your visit, since you won’t have to wait in line at one of the ticket counters. 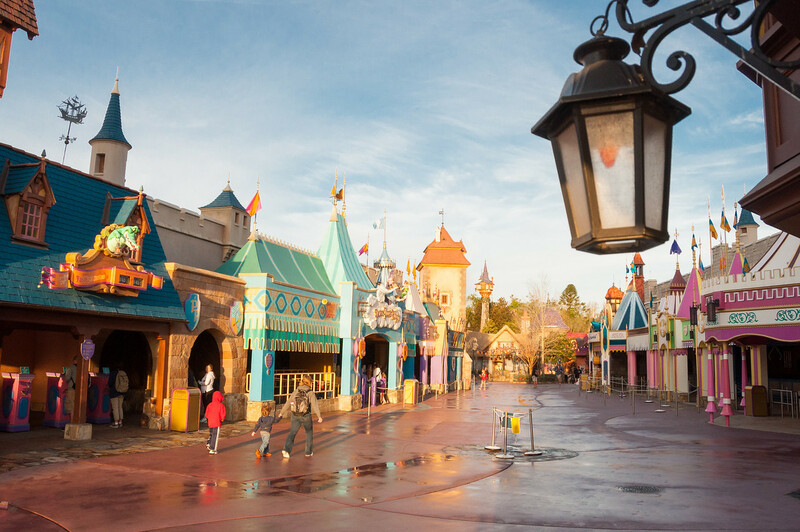 You can also get access to one of Disneyland’s Magic Morning hours if you’re purchasing a 3-day or higher ticket online. This in itself can be a huge advantage if you wish to take advantage of Magic Morning. OK, you probably figured this was coming, since I earn my living from the RideMax planning tool. But even if the detailed planning that RideMax allows isn’t quite your thing, you’ll still benefit greatly by mapping out at least a partial game plan in advance of your trip. Give at least give some thought to which attractions you want to start your day with, and then go from there. 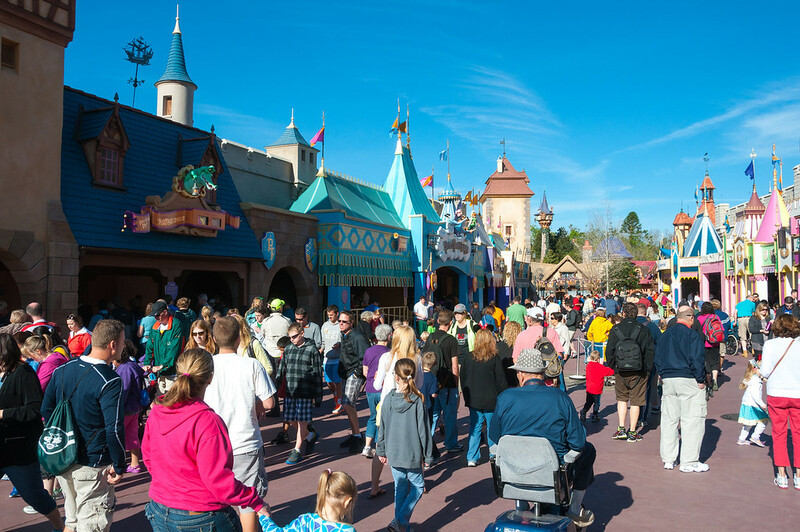 Visiting your attractions in an efficient order can literally make or break your day, especially when the park is crowded, so I’d advise spending at least a few minutes before your trip thinking this through. This will help keep you from wandering around the park with your head buried in the park map trying to figure this out on the fly later. In addition to arriving early, you can save yourself a lot of grief if you choose the “right” park for your visit date. 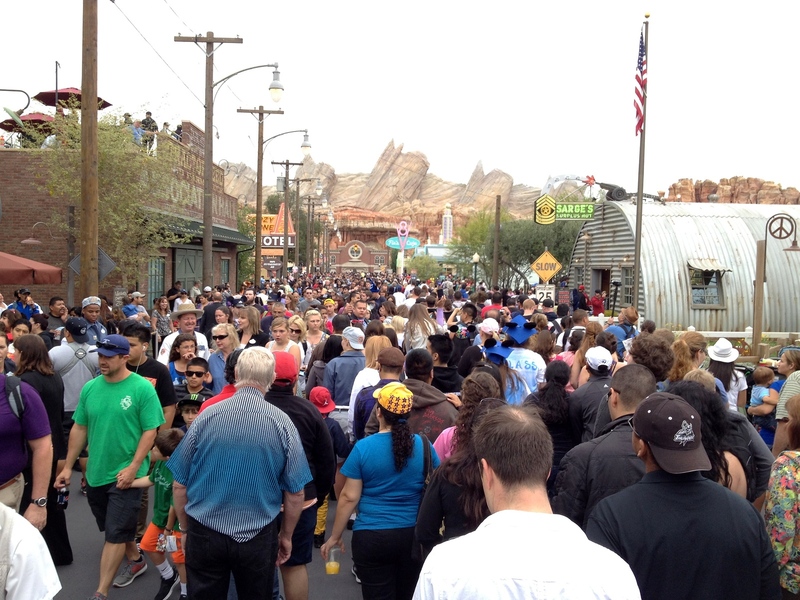 The example photo above shows absolutely nobody in front of me as I made my way to Radiator Springs Racers. The catch is that for most guests, this is only possible on certain days of the week. The reason for this is that both Disneyland and Walt Disney World host some an “early entry” program for their hotel guests, which gives these guests access to one of the parks one hour early on specific days of the week. For example, Disney hotel guests are normally allowed early entry to DCA on Sunday, Monday, Wednesday and Friday, and to Disneyland on Tuesday, Thursday, and Saturday. So, do yourself a favor this spring break and avoid the crowds by arriving early, buying your tickets in advance, having a game plan, and choosing the right park for your visit date. I think you’ll be glad you did! Are you planning a spring break visit to Disneyland or Walt Disney World? I’d love to hear your comments below! Even though Cars Land opened almost two years ago, the crowds can still be pretty intense, especially for this new land’s centerpiece attraction, Radiator Springs Racers. Here are three tips to reduce your wait. This may seem obvious, but using the FastPass system is a good way to reduce your wait on this ride. The trick, however, is that because the attraction is still so popular, FastPass tickets can run out very early in the day. So in order to take advantage of this tip, you’ll need to get in line for the FastPass machines no later than about 40 or 50 minutes after the park opens. You might get away with later than this on days of very low attendance, but why push your luck? Another less-obvious point here is that the lines can start out very long just to get a FastPass ticket, with the line forming near the Carthay Circle Theater even before the park has opened for the day. After about 30 or 40 minutes though, the line to get FastPasses will normally start to die down. As a result, if you’re using RideMax to plan your visit, you may find that the plan doesn’t have you get in line for the FastPass tickets until after you’ve already visited another attraction, while you wait for the FastPass line to die down a bit here. 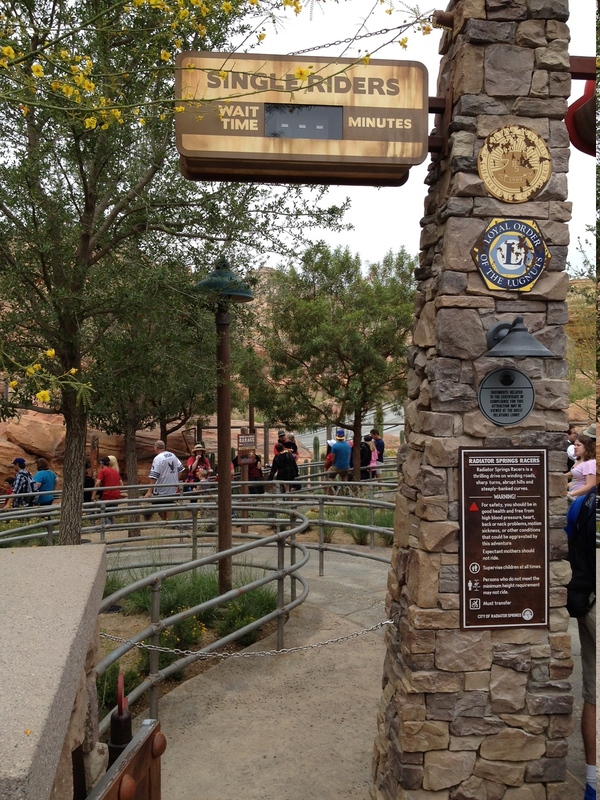 A perhaps less well-known fact is that Radiator Springs Racers offers a separate “single rider” line. For those unfamiliar with the single rider concept, you can use this line to avoid most of the wait, but the cost is that your party will most likely be split up, so that you ride in separate vehicles. The picture above shows the entrance to the single rider line, which is just to the left of the main attraction entrance. The single rider line likely won’t be an option for you if you have very young children who would be uncomfortable riding with strangers. But for older children and adults, it offers a very viable alternative to standing in a very long standby line. We’ve sometimes found ourselves even lucky enough to either ride in the same vehicle with someone else in our party, or — and this is even more fun — racing against someone in our group who happened to be seated in the car we “competed” with as part of the ride experience. Disney offers “Extra Magic Hours” (EMH) to its hotel guests, where they are allowed to enter DCA one hour before the “official” park opening time. EMH for DCA takes place on Sundays, Mondays, Wednesdays, and Fridays. So even if you arrive early on one of these days of the week hoping to beat the rush to Radiator Springs Racers, you’ll find hotel guests already in the park, many (most?) of which will try to visit RSR during the EMH hour, making for a long line right at park opening time. One common misconception here is that park-hopper “bonus” ticket holders sometimes think that their one-day “Magic Morning” privileges apply to DCA — they don’t. Magic Morning is ONLY available for use at Disneyland. If you want access to DCA’s EMH, you’ll need to stay at one of the Disney hotels. You know I have to save something for subscribers, so if you’re a RideMax subscriber, please also be sure to check out our “Tips & Hints” pages within RideMax itself, where we give some very detailed advice — complete with pictures — regarding this particular tip, including where to position yourself once inside the park. 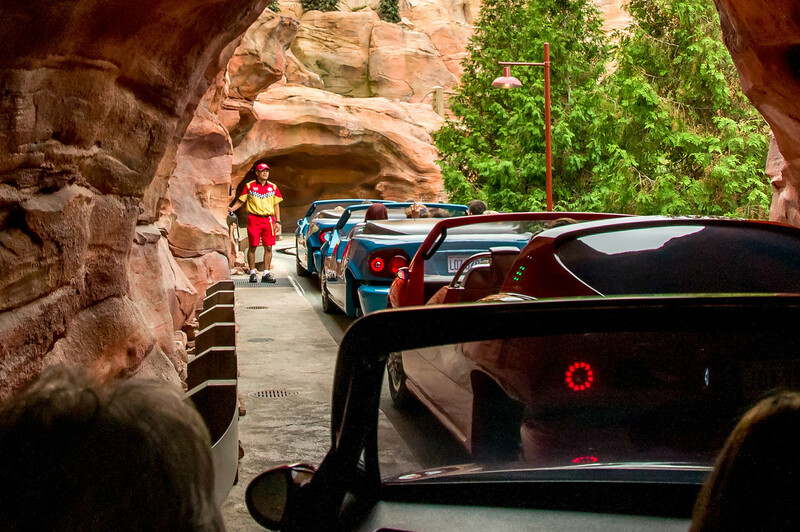 That advice can help you further beat the crowds to Radiator Springs Racers right at opening time. For those of you who have visited DCA since Cars Land opened, what did you think? Do you like the new attractions? What is your favorite? We’re recently back from another extensive multi-day Disneyland Resort visit. And with Cars Land approaching its one-year anniversary, we’ve made an important update to our Cars Land advice, available to subscribers from within the RideMax application itself. The real focus of the update is on Radiator Springs Racers (pictured above), as right now it’s the most difficult attraction to board without a significant wait in the entire Disneyland Resort. The update is focused on strategies for reducing your wait — and the strategy can change depending on the day of the week and time of the day. 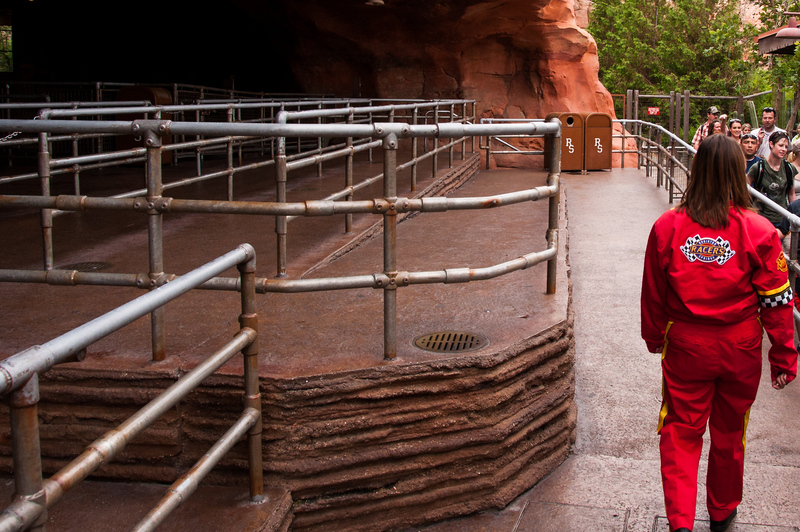 Along with the advice, we’ve included pictures, which I hope will make the advice more clear, especially for those who might be visiting Cars Land for the first time. 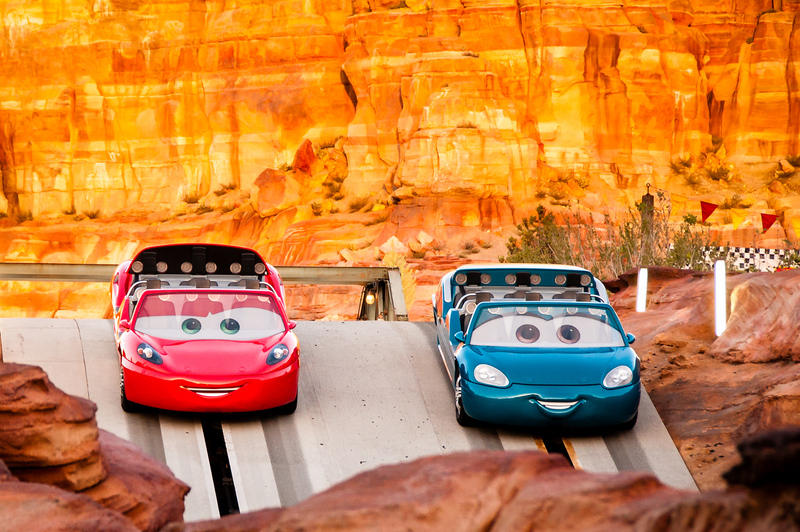 And finally, if you’ve visited Cars Land since its opening, what did you think? Did you enjoy these new attractions? Please leave your thoughts in the comments below!